The Washington-Carver commemorative is the last in “classic commemorative”: series issued between 1892 and 1954. 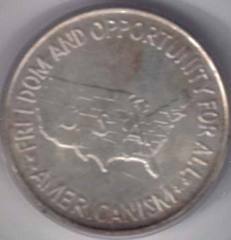 The history of this coin is tied to McCarthyism and loosely to the Civil rights movement as is the Booker T. Washington commemorative before it. By the mid 1940s when the B. T. Washington commemorative was authorized, congress and the U.S. Mint were getting tired of the exploitation and abuses of the system that had led to many commemoratives raising funds for perhaps less than worthy causes. The B. T. Washington Commemorative was authorized on promises by Mr. S. J. Phillips, president of the Booker T. Washington Birthplace Memorial Commission that the coins could be sold out through the “black Community” in little to no time. These promises were never fulfilled and in fact the BTW Birthplace Memorial Commission was facing financial hardship and potential ruin by the late 1940s. Enter Mr. Phillips for another trip to the proverbial well. This time the authorization was spun a little differently as Mr. Phillips, Capitalizing on the red scare of Rampant McCarthyism, added the clause specifying that the profits of the new issue were to be used “to oppose the spread of Communism among the Negroes in the interest of national defense”. Congress not wanting to cross swords with the good senator from Wisconsin or to seem “soft on Communism” authorized the coins with almost no discussion and President Truman signed the bill with equal dispatch. The authorization bill directed that all BT Washington halves not already sold (over 1.5 Million Coins) be melted and re-coined as Washington-Carver Halves. In addition the bill authorized the Bullion already earmarked for the BT Washington halves to be used for the same purpose. In all the bill authorized the coining of almost 3 ½ Million Washington-Carver coins. The original designs for the Washington-Carver half were provided by Isaac Scott Hathaway the black artist who had provide the Obverse design for the BT Washington Half. As with the previous Half dollar, he provided both an Obverse and Reverse design, and again his reverse was rejected. This time it was not a matter of artistic interpretation, but rather intervention by the State Department in the person of Secretary of State Dean Acheson, who objected to the design showing the American Legion badge and bearing the inscription “United Against The Spread Of Communism” as to inflammatory to the communist Soviet Union. The Obverse design shows the right profile bust of George Washington Carver overlapped in front of the slightly larger bust of Booker T. Washington. 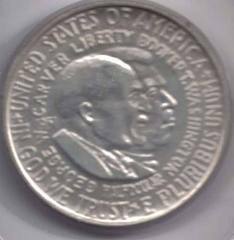 The two busts are ringed by two concentric rows of inscription the outer being “*United States Of America * E Pluribus Unum* In God We Trust” The inner ring includes; “George W Carver Liberty Booker T. Washington Half Dollar”. Finally the date has been snuck in behind Dr. Carvers head. In the outer ring the various phrases are separated by stars, in contrast to the inner ring were all of the phrases run together. In place of the originally proposed reverse design we have a rather mundane and certainly non-inflammatory map of the continental United States surrounded by the banner “*Freedom and Opportunity For All** Americanism*”. The mint mark appears just above the words at the lower edge of the reverse. As happened with the BT Washington halves, sales were sluggish at best and total authorized mintage numbers were never reached. In addition, many of the coins were returned to the Mint to be melted and re-coined. Of the over 2.4 Million Coins minted over 1 Million were melted leaving the total mintage at 1,330,802. Note that the mintages figures given in the guide book are the number coined. They do not account for any coins returned and eventually destroyed. The attached table from Breen and Swaitek give net mintage figures. Note that the melt figures are estimates by Anthony Swaitek from "all available information including relative Frequencies of appearance both before and after the rediscovery and dispersal of the hoard discovered in the Kaplan estate"